The Losar Festival in Tibet is the biggest event in the year. Celebrated with great fervor, the event is filled with age old ceremonies that commemorate the struggle between good and evil. The Tibetan people come out on the streets and chant, pass fire torches, dance and sing - a time for general merriment essentially! The last day of the preceding year is a day to prepare for the coming New Year. The monasteries are all deckled up in the finest decorations and a Blessing Ceremony is performed on the first day of Losar. Homes are freshly painted, families dress up in new clothes, good food and special dishes are cooked and there is a wonderful air of expectation of what the New Year holds. The celebration of Losar predates Buddhism in Tibet and can be traced back to the pre-Buddhist Bön period. In this early Bön tradition, every winter a spiritual ceremony was held, in which people offered large quantities of incense to appease the local spirits, deities and 'protectors' (Tibetan: chos skyong; Sanskrit: dharmapalas). This religious festival later evolved into an annual Buddhist festival which is believed to have originated during the reign of Pude Gungyal, the ninth King of Tibet. The festival is said to have begun when an old woman named Belma introduced the measurement of time based on the phases of the moon. This festival took place during the flowering of the apricot trees of the Lhokha Yarla Shampo region in autumn, and it may have been the first celebration of what has become the traditional farmers' festival. It was during this period that the arts of cultivation, irrigation, refining iron from ore and building bridges were first introduced in Tibet. The ceremonies which were instituted to celebrate these new capabilities can be recognized as precursors of the Losar festival. Later when the rudiments of astrology, based on the five elements, were introduced in Tibet, this farmer's festival became what we now call the Losar or New Year's festival. Losar is also known as Bal Gyal Lo. Bal is Tibet, Gyal is King, Lo is year. The Tibetan new year has been celebrated since the first King's enthronement celebration. It was started with the first King. That was why it has been known as Bal Gyal Lo. The Tibetan calendar is made up of twelve lunar months and Losar begins on the first day of the first month. In the monasteries, the celebrations for the Losar begin on the twenty-ninth day of the twelfth month. That is the day before the Tibetan New Year's Eve. On that day the monasteries do a protector deities’ puja (a special kind of ritual) and begin preparations for the Losar celebrations. The custom that day is to make special noodle called guthuk. It is made of nine different ingredients including dried cheese and various grains. Also, dough balls are given out with various ingredients hidden in them such as chilies, salt, wool, rice and coal. The ingredients one finds hidden in one's dough ball are supposed to be a lighthearted comment on one's character. If a person finds chilies in their dough, it means they are talkative. If white-colored ingredients like salt, wool or rice is inside the dough it is considered a good sign. If a person finds coal in the dough it has much the same meaning as finding coal in one's Christmas stocking; it means you have a "black heart". The last day of the year is a time to clean and prepare for the approaching New Year. In the monasteries it is a day of preparations. The finest decorations are put up and elaborate offerings are made called “Lama Losar”. In the early dawn of this day, the monks of Namgyal Monastery offer a 'sacrificial cake' (Tibetan: tor ma) on top of the main temple (Potala in Tibet) to the supreme hierarchy of Dharma protectors, the glorious goddess Palden Lhamo. Led by the Dalai Lama, the abbots of three great monasteries, lamas, reincarnated monks or tulku, government officials and dignitaries join the ceremony and offer their contemplative prayers, while the monks of Namgyal Monastery recite the invocation of Palden Lhamo. After the completion of this ceremony, all assemble in the hall called Excellence of Samsara and Nirvana for a formal greeting ceremony. Seated on his or her respective cushions, everyone exchanges the traditional greeting, “Tashi Delek”. 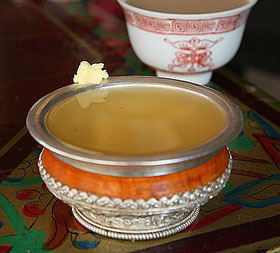 In order to wish the Dalai Lama good luck for the coming year, consecrated 'sacred pills' (Tibetan: ril bu) made out of roasted barley dough are offered to him by the representatives of the three great monasteries, the two Tantric Colleges, etc. Then entertainers (garma) perform a dance of good wishes. And two senior monks stage a debate on Buddhist philosophy, and conclude their debate with an auspicious recitation composed especially for the event, in which the whole spectrum of Buddhist teaching is first briefly reviewed. A request is made to the Dalai Lama and to all holders of the doctrine to remain for a long time amongst beings in Samsara (Sanskrit) in order to serve them through their enlightened activities. The official ceremony of the day then concludes with a ceremonial farewell to the His Holiness, who then retires to his palace. The second day of Losar is known as King's Losar (gyal-po lo-sar) because officially the day is reserved for a secular gathering in the hall of Excellence of Samsara and Nirvana. His Holiness and his government exchange greetings with both monastic and lay dignitaries, such as representatives of China, India, Bhutan, Nepal, Mongolia and other foreign visitors. Then from the third day onwards, the people and monks begin to celebrate and enjoy the festive season. 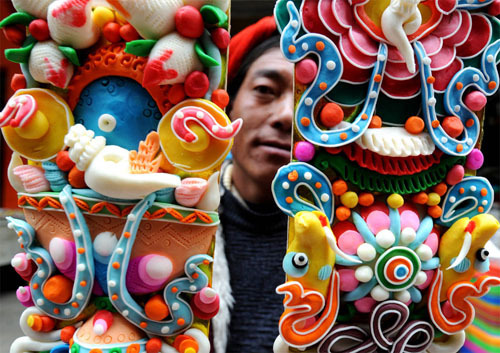 In many parts of Tibet, Losar is celebrated for fifteen days or more. In India it is celebrated for three days. In other countries celebrations may be as little as one day. The Losar is also celebrated in Nepal and India as well, where there is a strong concentration of the Buddhist population in the states like Arunachal Pradesh, Sikkim, Himachal and Ladakh in Kashmir. 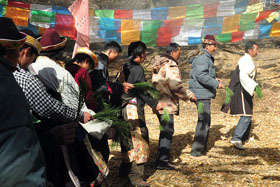 The Monpa tribe of Tawang and the Memba of the Mechukha valley of Arunachal celebrate Losar. Yet the Memba of Mechukha celebrates Losar one month earlier than the other Losar-celebrating peoples. The word of Losar is a Tibetan word which means New Year. The word is composed of two characters: Lo and Sar. Lo means Year and Sar means New. The celebration of Losar can be traced back to Tibetan pre-Buddhist period. At that time, Tibetans were followers of the Bon religion, and held a spiritual ceremony every winter. During the ceremonies, people burnt a large quantity of incense to appease the local spirits, deities and protectors. Later, this religious festival developed into an annual Buddhist festival, solar, in the reign of Pude Gungyal, the ninth King of Tibet. As Tibetans around the world gear up to celebrate their biggest celebration of the year; it is not surprising to know that Losar is the most special occasion for them to exchange warmest greetings to their fellow relatives, family members and neighbors and to everyone around. Losar, for Tibetans, means mass celebration, complete relaxation and, plenty of festivities with abundance of festive-meals and being in best dressing clothes. Offering Khatas (traditional greeting scarves) on the home altars, in monasteries and around each other with heartfelt Tashi Delek greeting all mean flourishing auspiciousness and greater prosperity. "It is time again for prosperous Losar," Tibetans would generally exult. It's time of the year for ultimate family gathering, lavish spending and joyous atmosphere at home. It is a valued culture for Tibetans to be kind hearted, hospitable and welcoming to guests, but it is on Losar days that these cherished values are most visible. Tradition has it that one has to be very warm hearted, generous and welcoming during Losar celebration. A bright and jovial mood on Losar is supposedly believed to ensure that a person will be blessed with good and happy expression throughout the year. A guest to a Tibetan family during Losar is always received with utmost hospitality. Among other things, a hearty meal and overflowing Chang will always await a guest. So do, Tibetans extend heartfelt welcome to guests during Losar. The Tibetan New Year offers travelers a great opportunity of enjoy the annual festive occasion with local Tibetan People together. 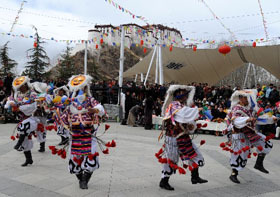 During the festival, a series of Tibetan style celebration activities would be held during this period. 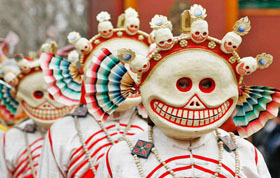 Tibetan people celebrate by some ancient ceremonies which represent the struggle between good and evil. Lamas are chanting and passing fire torches through the crowds. People perform the dance of the deer and amusing battles between the king and his ministers, and so on, people are cheering for the coming New Year by dancing, singing, and merrymaking. 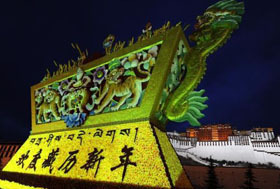 During the Tibetan New Year, local Tibetans would go to Lhasa to pray for blessing in the monasteries and make a pilgrimage around the circumambulation. Tourists can also see a hilarious scene on Barkhor Street and Jokhang Temple. 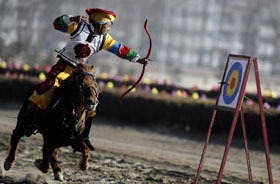 Some sports competitions would also be held on Barkhor Street Square during the festivals. 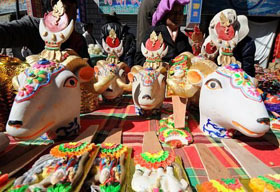 The rich celebration activities made Tibetan New Year to be one of the most attractive Tibet festivals on Tibet Calendar. Tourists making a Tibet tour in February could not only appreciate the picturesque snow-landscapes under the lovely sunshine but also enjoy the special festal atmosphere, the Tibetan acrobatics and Tibetan Opera. Both the world’s highest peak – Mount Everest and the China’s most beautiful snow mountains–Namjagbarwa show their best state without being covered by mist. Though most areas of Tibet are still very cold in February, Lhasa is a city without chilly winter and hot summer. But there is a great temperature difference between the day and night. At daytime, people can enjoy warm sunshine, while a down coat is a must. However, you do not need to worry too much about it. With the development of Tibet tourism, tourist facilities have been greatly improved in recent years. Hotels with air condition or heat supply are available in Lhasa. Of course, cheap guesthouses will be a bad choice in winter for they do not provide heat. In fact, most hotels in Lhasa offer discounted price to attract tourists in winter. Since the direct flights and trains to Lhasa are only available in few domestic cities, including Beijing, Chengdu and Shanghai, Guangzhou and Chongqing, it might be difficult to get a ticket during summer which is the peak time of Tibet tourism. But in winter, it is much easier to book a train ticket or air ticket to Lhasa. Some airlines even would offer considerable discount. With mellow smell of traditional snack-khabse and sweet sour odour of Chang overflowing in the air; Losar begins by tossing chang and Chemar offerings and exchanging greetings by saying Tashi Delek (meaning-Prosperity, Sound Health and Goodness!) to family members and neighbours. On New Year’s Day even young Tibetans wear Chuba (traditional Tibetan attire) and pay their first visit of the year to a temple with their family early in the morning. After that, Tibetans do nothing but feast on the food and drinks that they have so painstakingly prepared. The New Year’s Day is for family celebration and everyone spends time with family or the neighbours. From the second day onwards, they then visit their relatives and family friends. They visit each other’s feats and have parties full of drinking and singings and dances. On Losar days, Tibetans don’t miss an opportunity to enjoy gambling, with games of Sho (Dice), or, Pakchen (Mah-jongg). In recent times, many have fallen to playing-cards too. For young Tibetans, Losar is the time to thicken their pockets with lots of gift money. On the third day, as the festivity continues, Tibetans replace the year-old Dhar-choks and Dhar-shings (hoisting of prayer flags) on the roof of their houses with new ones and burn thick bunches of Sang (Incenses). 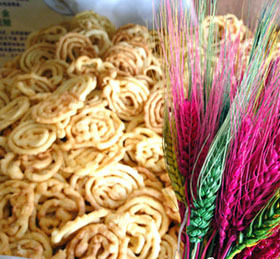 Upon hoisting, barley flour is tossed into the air screaming Kyi-kyi So-So Lha Gyalo!!! (Happiness, Happiness and let Victory be to God). December 29th is New Year eve. In the day, Tibetans will change new cloth for the window and door; stick new sutra steamers on the roof; paint auspicious designs on the door, walls and kitchen to make festive atmosphere. In night, all the family members sit together to have “gutu” (gǔ tū 古突) which is similar with reunion dinner in Han nationality. Gutu is trickled pastry with stone, wool, charcoal, coin and other things in it. People who eat these things must take out for it omens one's life and heart. Stone presents heartless; wool presents kind-hearted; charcoal represents vicious; while coin represents rich. So, all of them hotly discuss and laugh and prompt the happiness to climax. Then, the family use tsampa to make succubae and two bowls and pour the left bones and leavings of gutu into the bowls; ask a woman run out to throw the succubae and blows, a man following her with fired dried hay and say the words: succubae come out, succubae come out!" then, fire the succubae and leavings to ash. At the same time, children will set off firecrackers to drive off evil and welcome auspicious year. In the first day of New Year, the hostess will get up early. About 5 o'clock in the morning, she will prepare a pot of “qiangku” (qiāng kū 羌枯) which is made up of tsampa, black sugar and barley wine and send it to every family member. The family members will not get up; they drink up the "qiangku" and sleep again. The hostess will sit next to the window to wait for the sun rise. When the sun just rises, she will come to river or lake to get the first bottle of water in new year. In legends, water at that time is the most purity and sweet. In the first day, people will close door to refuse customers. The streets are cheerless. People only celebrate festival and hold religious activities in house. 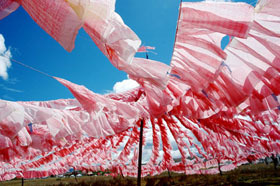 The preparation work of the New Year Festival starts from early of December in last year. 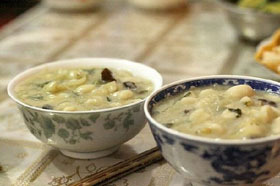 Except the things for eating, drinking and playing, every family will make a “Qiema” (qiē mǎ 切玛) which is a wooden box with colorful designs on it, and the fried barley and tsampa which is mixed by butter in the left and right side of the box, barley tassels and colorful butter flower on it. They will use water to soak a blow of barley seeds and make it grow out green crops in next Year. The crops of “Qiema” are sacrificed in the middle of religious desk to pray for harvest in the next year. When the festival comes, males are busying for clean the house, while females are busying for making “Kasai” (kǎ sài 卡赛) which is a kind of butter wheaten food in ear shape, butterfly shape, rectangle shape, square shape, circle shape and other shapes, colored and covered by sugar. It is an artwork on the desk and delicacies to entertain customers. The kinds and color of “Kasai” is the symbol of how diligent, clever and kindhearted the hostess is. So it is outstanding in the festival.